In Part 2, I talked about templates – what they are and why you might care. This week, I’ll talk a little about word processors, then we’ll get into the nitty-gritty about templates and how to customize them. First, since most of the work required to publish a book involves typing the text, let’s start with a word about word processors (ouch!). In the pc based world, three of the main choices are Microsoft Word, Apache OpenOffice and LibreOffice. I’m quite sure everyone reading this is familiar with MS Word. OpenOffice began when Sun Microsystems acquired the StarOffice office suite and “Open-Sourced” it as OpenOffice in 2000. Because OpenOffice was free to the user and because much of the development was done by volunteers, it quickly became a popular and full featured word processor and office suite. When Oracle purchased Sun Microsystems in 2011, they halted the development of OpenOffice, which caused a number of disgruntled developers to split off and start LibreOffice. Later, Oracle gave the rights to OpenOffice to the Apache Software Foundation, and development was begun again. Today, LibreOffice and Apache OpenOffice are very nearly identical, although I’d give a slight edge to LibreOffice. Microsoft continued the development of MS Word as well, of course, and now, all three do the basic stuff extremely well. All three have strengths and shortcomings when compared to the others, and there are websites that have devoted pages to detailing the differences. For the most part, however, any of them will get your book from basic text to a form that can be published. I favor LibreOffice over MS Word for two reasons: MS Word is expensive while LibreOffice is free, and, the last time I checked, LibreOffice could export files directly to EPUB format – the format used by the majority of eBooks - while MS Word lacks this feature. (There are two caveats: this is easily accomplished using one of the free conversion programs like Calibre, and the latest version of LibreOffice doesn’t execute this step all that well when there are images involved). Given all that, my choice is LibreOffice - it does most everything I need... and it’s free. I have two versions of each of our books – the printed version and the eBook version. The text itself is the same, but the presentation differs between the two. 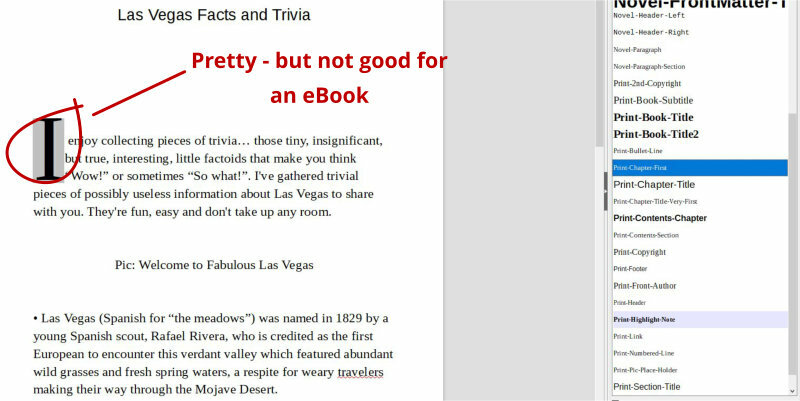 For example, the printed version includes page headers at the top of each page and the page number at the bottom while the eBook version has neither. The Table of Contents (TOC) has chapter headings and sub-headings, each with a page number, while the eBook TOC uses hyperlinks to go directly to each heading. The font types and sizes are very important in the printed version, but less so in the eBook since most eReaders will change the font to the reader’s preference anyway. Edit and proof the book, chapter by chapter, correcting any errors. Remove all formatting from the text. The printed version is more forgiving of things like multiple returns, but the eReaders will generate some odd looking pages if there are embedded formatting characters. Use the style template for the printed version of the book to get the text and photos set up just the way we like them. Then I export the file in a .pdf format and print it. Marcie and I read and re-read the book at least 3 times each, looking for errors. Once we are confident we’ve found all the mistakes and tweaked the grammar until it’s perfect, I make the manuscript corrections, check it once more and send copies to friends who patiently read it again and find the couple of dozen errors we both missed. After this next set of corrections is made, the printed version should be just about complete. All that’s missing is the front and back cover, which I’ll work on later. Once it’s saved and backed up one last time, I select all the text (by clicking on ‘Edit-Select All’ or by pressing CTRL-A) and copy the text to the clipboard (by left clicking on ‘Edit-Copy’ or by pressing CTRL-C). Next, I start producing the eBook version, and this is where all that work on the templates pays off. I left click on ‘Files-New-Templates’, and then double click on my eBook template. This opens a new text document. Then I paste the text from the clipboard into the document (by clicking on ‘Edit-Paste’ or pressing CTRL-V). The entire book will immediately be reformatted into the style I want for the eBook version. As I mentioned in the last blog, I didn’t create my style templates from scratch – I downloaded a free version I found online and modified it to my liking. 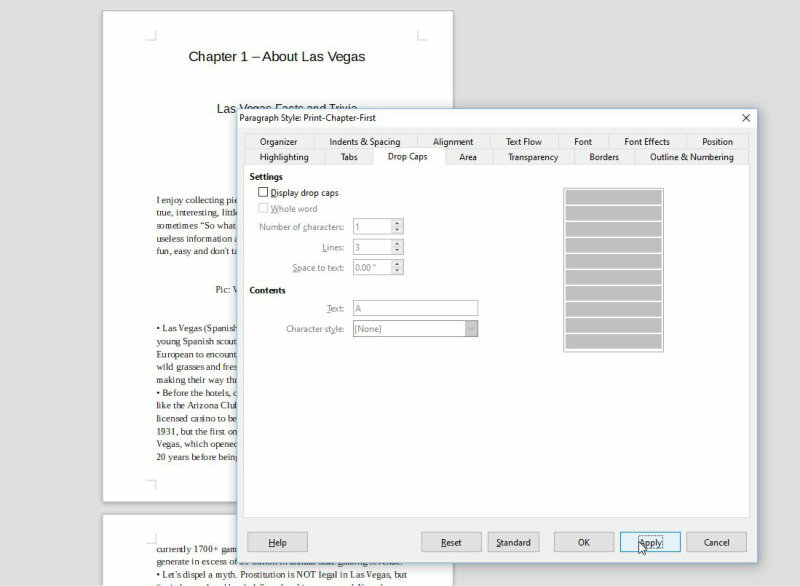 For example, the style for the first paragraph of a new chapter starts with a ‘Drop Cap’ as shown below. This doesn’t translate well by all eReaders, and I want to modify the style to remove it. 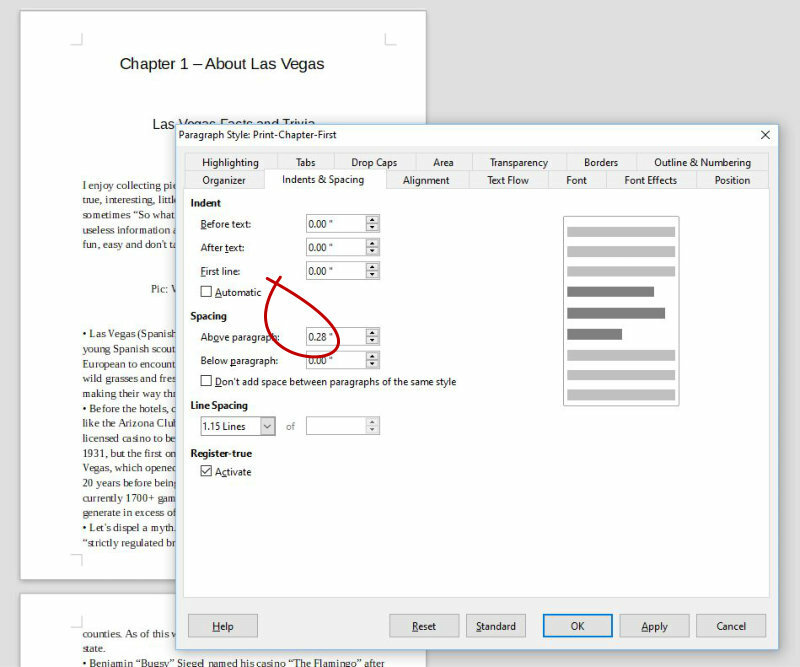 I can either left click ‘Styles-Edit Style’, or open the ‘Styles’ sidebar, right click on the ‘Print-Chapter-First’ style, and left click on ‘Modify”. As you can see, there are a lot of style settings that can be modified – fonts and font effects, spacing and indents, alignment… I want to get rid of the ‘Drop Cap’, so I click on that tab, and un-click the box that says ‘Display drop caps’. If I click on ‘Apply’, I can see it disappear from my paragraph. I also want to reduce the space above the paragraph, and I can do this via the ‘Indents and Spacing’ tab. Clicking on the ‘Apply’ button will show me how the paragraph looks. Too much space above the paragraph for an eBook. There are lots of interesting effects that can be used, and it’s fun to experiment with them. In general, however, it’s best to save the more interesting style effects for the printed version of the book, and use a very simple, straightforward style for the eBook. When the style is to my liking, I want to save the template. First, I save the eBook – in this case ‘LV_Non_Gamblers_eBook’. Then to save the template, I ‘Select All’ (CTRL-A) and press ‘Delete’ to get rid of all the text and photos. Then I click on ‘File-Templates-Save as Template’, name it (in this case ‘eBook Template’) and save it in the file ‘My Templates’. We’re making some progress now, and the hardest part is over. In the next blog, I want to expand on a few of the steps above, like some tips on removing the formatting from the text, inserting photos and graphics in the two versions and some things to avoid in the eBook version. Then we’ll make a gorgeous cover and begin the actual publishing. Hang in there!